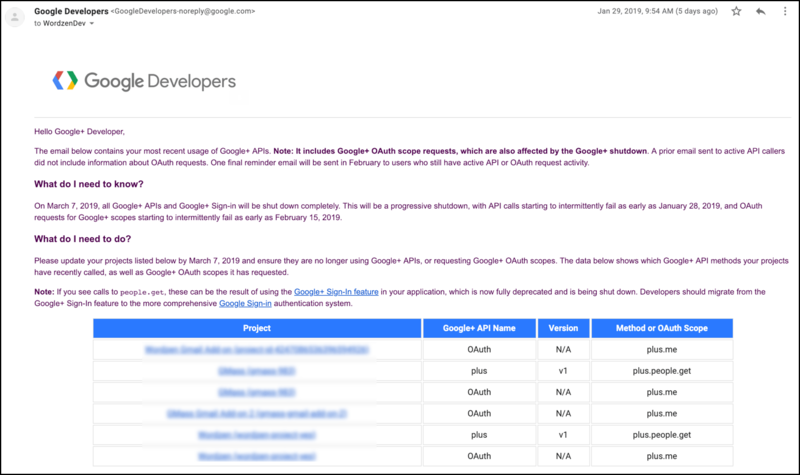 If you’re a developer using any part of Google’s API, you’ve likely received notices informing you that come March 7, 2019, the Google+ API will be shut down. There’s been some confusion in Google’s notices that makes it unclear exactly what will still be available after the shutdown, so in light of this confusion, I’ll show you what we at GMass have done to address the issue, and how we’ll use Google’s OAuth2 mechanism to still create accounts and retrieve a user’s email address after a successful OAuth flow. 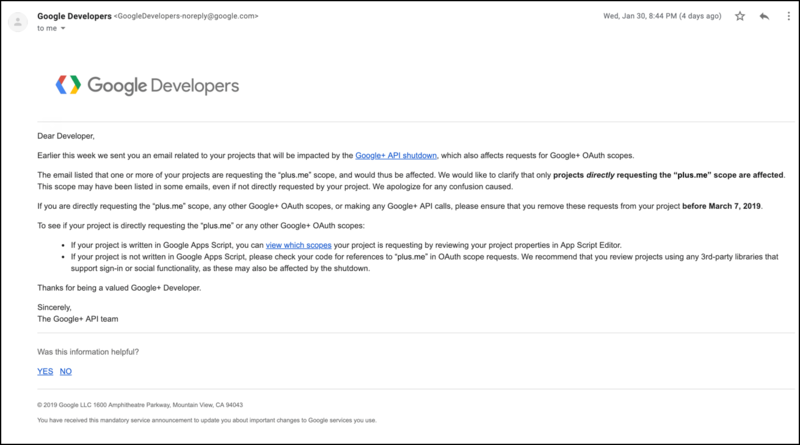 This notice is still confusing because although it says that only projects that call the plus.me scope directly are affected, it goes onto say that a project making “any Google+ API calls” should be updated. Take GMass for example. GMass doesn’t request the plus.me scope directly, but DOES make a call to a Google+ API method. So there you have it. We are now retrieving the user’s email address using the getProfile method which is part of the Gmail API. We are able to do this because one of the scopes that GMass requests is the https://mail.google.com API scope. If your project is not a Gmail extension, you likely are not requesting this scope, and may need to find another method to retrieve the user’s email address.